Tigercat Industries Inc. is a forestry and offroad industrial equipment manufacturer with nine different facilities in southwestern Ontario. The company was started in 1992 as an offshoot of MacDonald Steel. Owner Ken MacDonald decided the company needed to develop an end product of its own to keep its steel fabrication business operating to capacity. That first product was a drive-to-tree feller buncher designed specifically for the southeast U.S. The small Tigercat team had uncovered significant deficiencies in the machines that were available to the market at the time and tasked itself to build a better alternative. Since then the company has branched out into skidders, loaders, and peripheral equipment that can serve both the forestry industry and other offroad industrial needs. The company’s growth has created opportunities for it to rethink its production processes. Most recently it was decided that most cab production would be consolidated in one facility on Morton Avenue East in Brantford, Ont. Tigercat has owned the building the cabs are being built in now since 1998. It most recently served as a parts facility and has been the company’s head office for about a decade. With the purchase of a new building across the street, the company has moved the parts department, and this newly focused cab production plant opened just last year. Cabs for industrial equipment are complex. The shape demands a number of weldments in awkward positions, and the variety of metal components included require cutting, forming, and bending of many parts that range widely in size. Beyond the metal, there’s paint, insulation, and electronics to consider for the assembly. By adopting a newer style of tooling on this Cincinnati press brake, operators have been able to reduce tooling changeovers substantially. Tigercat is dedicated to having this facility follow the lean manufacturing model commonly known as the Toyota Production System. “We don’t have room for warehouses of inventory here, so our main objective is to use one-piece flow whenever possible throughout the facility,” said Jason Iles, plant manager for the cab production facility. All items for one cab are kitted out on a custom designed carrier to move them from bending to welding. Even for laser cutting, Iles’ first priority isn’t nesting as many parts as possible on one sheet, it’s making sure that the press brake is fed with one cab’s worth of material when it is required. Standardization is important for Tigercat as a company. 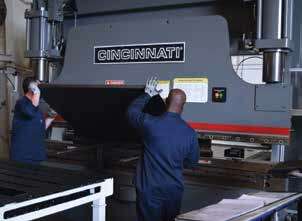 It uses Cincinnati presses and lasers throughout its facilities. Tooling is one place where Iles’ team has found some efficiencies. Management is attempting to drive up the efficiency of its CO2 laser by driving down the number of different materials used in production. This skidder is set to leave the Savage Drive plant in Cambridge. A finished cab is ready for shipping. To make improvement efforts easier, Iles and his team focus on standardizing processes. Iles is by no means blazing a new trail at Tigercat with the work he is doing at the Morton Avenue East plant. Rather, he’s following the lead of what might be considered the jewel in the crown of Tigercat’s just-in-time commitment—the company’s Savage Drive plant in Cambridge, Ont. This facility manufactures the company’s 600-series skidders. A 620E 4-wheel skidder is ready to be equipped with wheels. Barroso noted that fittings and hardware now come into his facility kitted out for one machine at a time. “We are trying to do this with every single component so that there’s no stock except what is on the assembly line,” he said. Visually it is also easy to monitor production on the factory floor. The Savage Drive facility does not use an MRP system, but Barroso explained that, with the use of a board that his team designed and by taking a quick walk around the floor, anyone who works in the facility could tell a visitor where they are in production and whether they are running behind anywhere. As for finding more efficiencies, Barroso said that it’s an endless process, requiring constant dialogue with purchasing and design to push efficiencies through the process. But there’s no denying that, in more than 10 years of keeping his team’s eyes on the seven wastes and the flow of product, Barroso has managed to make the Savage Drive plant a model of what Iles and his team are striving for. In the course of its first 25 years, Tigercat has become a leader in its field and continues to expand.